We consider here the case of the Ratra-Peebles quintessence cosmology for a 648h-1Mpc boxsize and 512^3 particules. 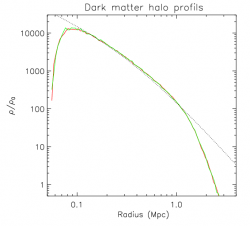 The profil is obtained by averaging 500 DM haloes of mass M=10^14 solar mass. Dark matter simulations 512^3 for a 648 h-1Mpc boxsize. The Babel run on 512 proc stands in red, whereas the Platine run on 64 proc stands in green. We observe that the 2 profils are identical up to statistical fluctuations. The the Bullock prediction for the NFW profil is indicated for a concentration C=5 at the Mass*= 10^14 Msol (after Bullock et al 2001). The NFW prediction agree with the profils for a large range of radius but decline at larger radius since DM particules are excluded by the FoF 0.2 criterion. The inner cusp is not observed either, but the mass resolution at the very center do not permit to draw no conclusion yet. 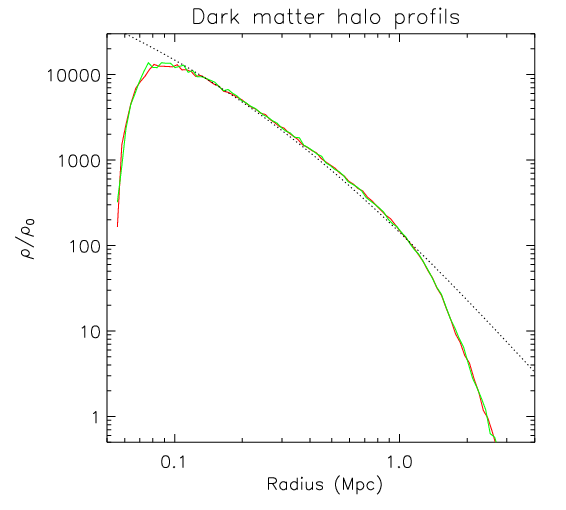 We consider here the same case ( RPcdm ; 648h-1Mpc ; 512^3). The profil is also obtained by averaging 500 DM haloes of mass M=10^14 solar mass. But in this case we compare the same Ramses run analysed with the sequential and parallel version (F.Roy) of the FoF algorithm. We indeed find the same profils.